out into the spaces we breathe. The first thing I did last night upon arriving home from work was, as usual, to feed the cats. Conspicuously absent, as she had been that morning, was Flo. Something didn’t feel right…she’s usually the one waiting in the drive when I pull up. When I took Belle, my Pomeranian, outside, I decided to look around…and saw something laying near the house under a Needlepoint Holly. It was Flo…curled up peacefully…but with eyes fixed in a distant gaze. I’m not quite sure what happened to her…no evidence of foul play…just ‘gone’ from this world. I picked her up…carried her into the woods…and buried her the best I could. There’s been no rain lately, and the ground wouldn’t give in to the old shovel that I brought along. I gently laid her at the base of a sweet gum…heaped a pile of dried up leaves over her…and then covered it with some dried up branches. 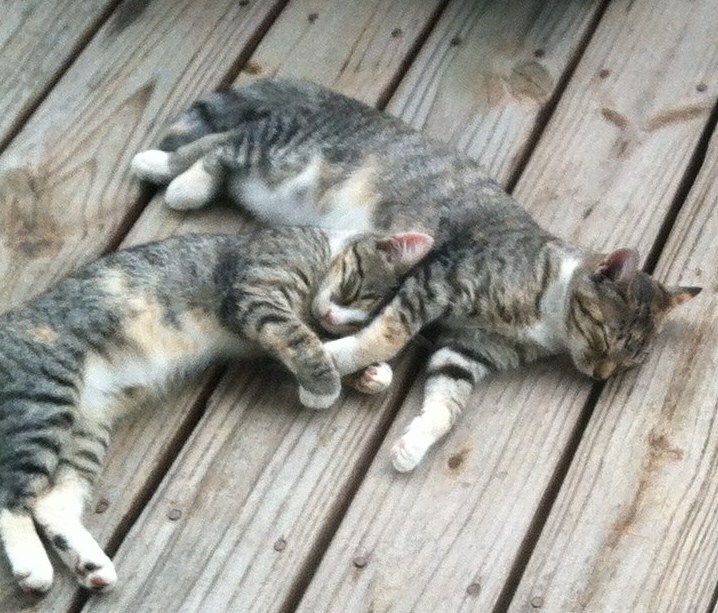 It set me thinking…about this little wild beast that had showed up on my doorstep about a year ago, with her sister Eddie…both tiny kittens. What was her world like for that brief span of time…what wonders did she see that I haven’t seen…and will probably never see from her particular point of view? What did she think of me when she rubbed her head against my leg when I sat on the porch…purring like she was in seventh heaven? Did I reciprocate…giving her the attention she deserved? Or did I just dismiss her as some cute little animal? There’s something deadly serious going on here…something that we need to pay attention to. Something that deserves our attention…because it only endures for a very brief time. It was 48 degrees this morning when I woke up. Not many more…if any…of these cool nights left. Making the best of this glorious, late Spring day, I took a walk down the road. I could now understand why I had not seen the sentinel rock until this past winter. The trees, and other scrubby vegetation on top of it, and surrounding it…left it in very dark shadows. If I didn’t know it was there, I would be oblivious to that massive hulk of a boulder lurking just off the roadside. But now I know where it lives…and it’s become a somewhat reassuring presence. Something that will outlive me. 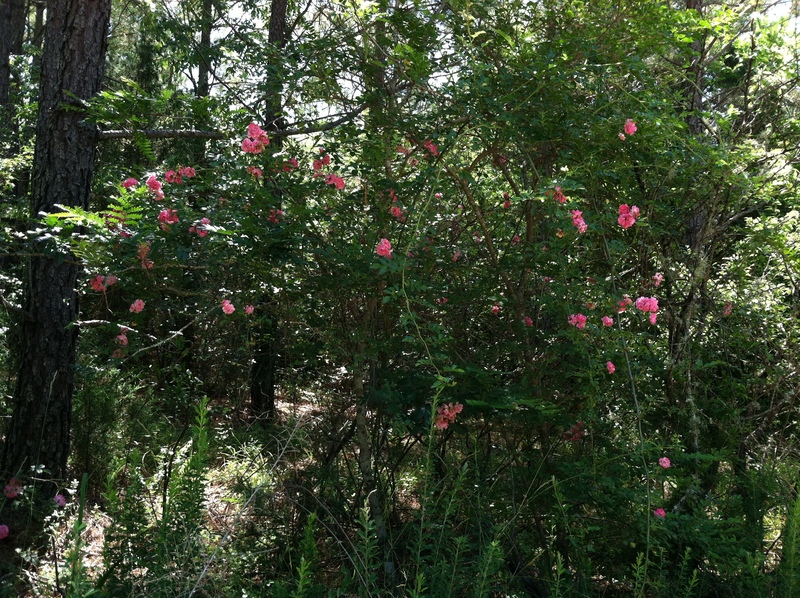 Driving down the road the last few days, I had noticed some pinkish blooms, tangled among the trees and bushes. That was my mission this morning…to discover exactly what they were…to help fill in my mental map of my little corner of the Waxhaw woods. When I found them, it was immediately apparent from the thorns that they were wild roses. My best guess…is Rosa Virginiana, which is native to the Eastern United States, and which tolerates clay (much of the soil around these parts is reddish and very clayey). Earlier this morning, sitting out on the front porch with Belle, in the chilly air, I heard a bird that I’ve been trying to identify. I grabbed my binoculars and spotted it at the very top of the tallest Sweet Gum tree (it must be about 70 feet high…with what I’m guessing is a spectacular view of the area). The dark head, white breast, and reddish sides confirmed my suspicions. It was an Eastern Towhee. I remembered this bird as the Rufous-sided Towhee back in Illinois, but the voice is somewhat different here in the East…which led to some confusion. Even though now, I think, it’s considered the same species. I am discovering, though, that there seem to be geographical variants in the voices and calls of many birds. My ‘day of discovery’ was capped this afternoon when I went out on the back porch to water my vegetable garden…which consists of one containerized cherry tomato plant that was purchased at Home Depot. It’s doing very well…even has some little green tomatoes already. As I was watering…something caught my eye. A little head sticking under the railing. 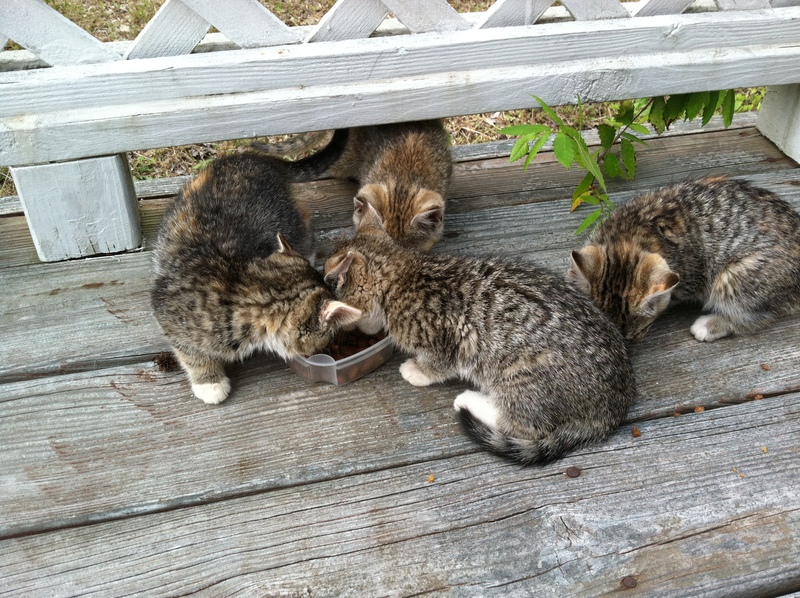 It was a kitten…followed by three more. They clambered up on to the deck looking pretty pathetic and probably very hungry. 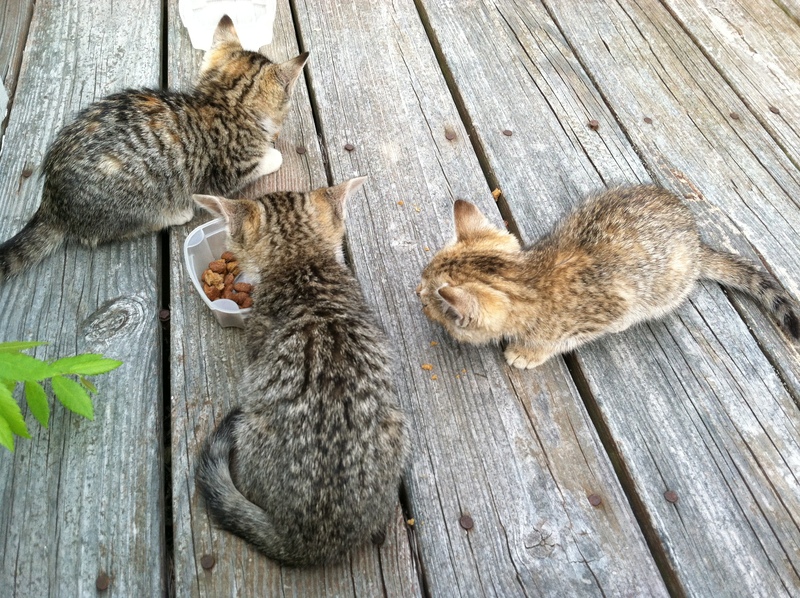 I went inside to get a dish of water, and filled up a little dish with some dry dog food (hopefully…that’s ok for cats? We once had a cat for a very brief time…NEO was his name…short for Near Earth Object. But that’s another story). They attacked the food like there was no tomorrow…which for them, sadly, may be the case. 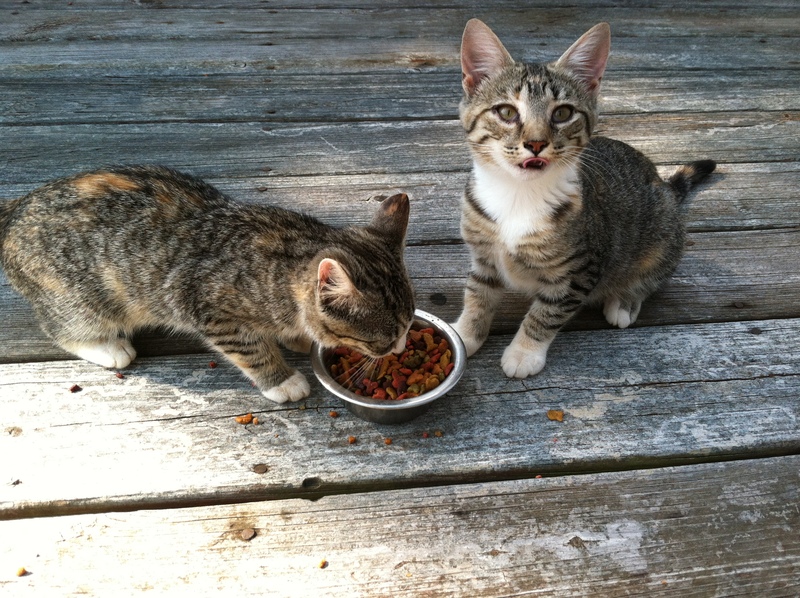 They’re most likely feral cats…but they are very cute. Hopefully…they’ll wander away and find a good owner. But…I may end up buying some cat kibble…just in case.